The large, fleshy muscle group called the quadriceps femoris (kwod'ri-spes fem'or-is) occupies the front and sides of the thigh and is the primary extensor of the knee. 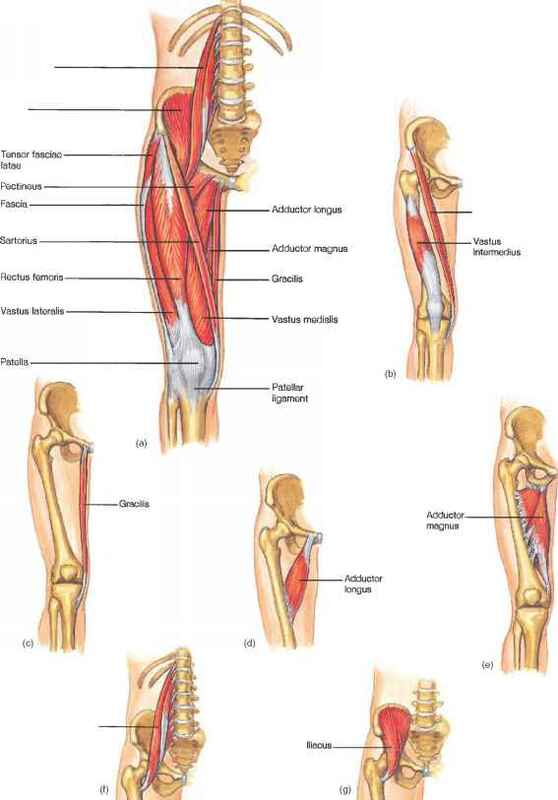 It is composed of four parts—rectus femoris, vastus lateralis, vastus medialis, and vastus intermedius (figs. 9.35 and 9.38). These parts connect the ilium and femur to a common patellar tendon, which passes over the front of the knee and attaches to the patella. This tendon then continues as the patellar ligament to the tibia.